Could this be the only tripod you will ever need? On paper, the Manfrotto Digi Mini looks like the perfect solution. It's light, it's compact, yet it extends to a very useful height. It has a built-in pan and tilt head, a carry bag is included in the price and the maximum weight capacity of 3.5kg is more than enough for any compact camera or SLR with 'kit' lens. Given the fact the legs come in four sections, it's not surprising that the Manfrotto takes a few seconds longer to set up than some of its rivals, and once it's at full height, it does look a bit spindly. But there's not much wobble at full column extension and very little twist and flex in the tripod itself. The centre column movement is a bit jerky, but it's so, so easy to operate - you just pull down a spring-loaded catch to move the column, then release it to lock it again. While the pan and tilt head looks fairly small, its movements and rigidity are excellent. It has only one handle, which can lock the pan and tilt axes simultaneously. There's even a quick-release plate, though this has to be screwed into the camera base using a coin to turn a slotted screw head, which is a bit of a fiddle. Even if you don't choose the Manfrotto as your 'first' tripod, it would make a superb carry-anywhere backup for travelling. 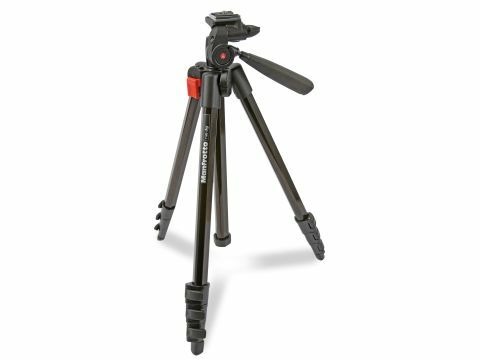 It's not the most versatile tripod we've tested, but the Manfrotto 718B is well made, easy to understand and use and performs extremely well for its size, price and weight. It's an exceptional package.